Shayon Harrison kicked off a big weekend for English abroad as he started for Melbourne City against Brisbane Roar. The forward on loan from Spurs scored in the second half to help his side secure a 4-1 win. It was his second goal in seven games since joining on loan in January. The result means Melbourne remain in the playoff spots. In the NPL Victoria, the second-tier in Australia, Harry Noon scored a sensational goal to guide Heidelberg United to a 3-2 win over Kingston City. Just watch this goal, what a touch! In the evening, Nick Blackman came off the bench for the final few moments of Sporting Gijón’s 1-0 win away to Tenerife in the second-tier in Spain. It was the Derby loanee’s 12th league appearance of the season as Sporting remain three points off the playoff spaces. In France, Josh Maja was an unused substitute for Bordeaux as they beat Marseille 2-0. He’s played just 141 minutes since moving in January from Sunderland. Over in the Netherlands, two English defenders started in the second division. Fankaty Dabo, on loan from Chelsea, played the full match as his side Sparta Rotterdam drew 1-1 with Den Bosch but Brandon Ormonde-Ottewill topped that, helping Dordrecht upset the odds and defeat top-of-the-table Twente 1-0 in their own stadium in front of 27,000 fans. Renny Smith also played for Dordrecht in a famous win for the side in 17th place. In Austria, former Chelsea youngster Ambrose Gnahore was powerless to prevent Bischofshofen losing 3-1 to Wals-Grünau in the Austrian third-tier and in Portugal, Chris Willock played 84 minutes in Benfica B’s 3-1 win of Farense. In La Liga, Patrick Roberts continues to be used as a substitute for Girona but he could not prevent his side from losing 2-1 to Espanyol after entering the game in the 60th minute. In Italy, Ronaldo Vieira made his sixth start of the season for Sampdoria but his side lost 1-0 to Roma. In Serie C, Stephy Mavididi came off the bench for Juventus U23s but they lost to Pisa 2-1. It was a bad day in the Bundesliga for teen sensation Jadon Sancho. In their top of the table clash, Borussia Dortmund were resoundingly beaten 5-0 by Bayern Munich, despite the England international playing the full match. In the fourth tier, Keanan Bennetts and Mandela Egbo both helped Borussia Mönchengladbach II defeat Lippstadt 3-0 and former Man City youngster Denzeil Boadu made his tenth appearance of the season for Borussia Dortmund II in a 3-0 win over Herkenrath. Fresh off the back of his goal in midweek for Lyon U19s in the UEFA Youth League, Reo Griffiths appeared off the bench for Lyon B in the fourth tier but they lost 5-1 to Marseille B. It wasn’t much better in Holland as Dan Crowley, Marcus Edwards, Greg Leigh and Sulley Kaikai all suffered defeat in the Eredivisie. There were victories for Kaine Sheppard and Adam Le Fondre in Australia though, for Newcastle Jets and Sydney respectively. Matt Derbyshire scored fifty goals in his first two seasons with Omonia Nicosia in Cyprus but has just two goals this season. He played the final twenty minutes this weekend in his side’s 2-0 loss to AEK Larneca. Billy Ions continues his recovery from injury as he played the last 27 minutes in SJK’s 1-0 win over HIFK in the first game of the season in the Finnish top flight. It is the Geordie’s seventh season in Finland. In the Israeli top flight, former Spurs and Rangers winger Nathan Oduwa made his eighth appearance since joining Hapoel Hadera and helped them to defeat Maccabi Haifa. In Poland, Tom Hateley made a cameo appearance off the bench to help his side Piast Gliwice hold onto a 2-2 draw with Wisła Kraków meaning the Englishman’s side remain in third place. Steven Caulker was an unused sub in Turkey for Alanyaspor. He’s made just three league appearances so far. In Sweden, there were debuts for Kundai Benyu for Helsingborg in the top flight and Ryan Binns for Åtvidaberg in the third-tier. In the fourth-tier, Ytterhogdals with their heavy English influence thrashed Sandviks 7-0 in the first game of the season to storm to the top of the table. All seven goals were scored by Englishmen with former Sunderland man Jordan Blinco scoring a brace alongside Kyle Sambor plus Moses Duckrell, Kieren Simms and Sam Alderson also scored one each. It was also a successful day for two former Crystal Palace men in the fourth-tier. League debuts for Christian Scales and Will Hoare ended in a 3-0 victory for their side Skellefteå over IFK Umeå with Hoare scoring and being names man of the match. Leaving Europe, Jordon Mutch made his fifth league appearance off the bench for Gyeongham but they lost 2-1 to Seoul in Korea’s K League 1. Finally, Wayne Rooney was sent off in a miserable day for DC United who lost 4-0 to Los Angeles FC. It was a better day for Mo Adams though as he started and helped secure a 2-2 draw away against Toronto for Chicago Fire. Reece Oxford made his return to the Augsburg starting line-up after suspension and illness but lasted just 27 minutes as his side lost 4-0 to Hoffenheim. Max Clark and Jake Clarke-Salter were involved in a high-scoring game in the Eredivisie, the pair played the whole match as Vitesse drew 3-3 with PSV. In the Singapore Premier League, Charlie Clough‘s dream start in defence with Brunei DPMM continues as his side beat top of the league Tampines Rovers 2-1 win. They now have three wins and a draw from their opening four games under the management of former Gillingham boss Adrian Pennock. PAOK went ten points clear in the Greek Super League with a 3-0 win over Lamia, Chuba Akpom played 64 minutes for the league leaders. In the Norwegian second-tier, former Sunderland defenders Michael Ledger and Josh Robson both started for Notodden as they picked up their first point of the season in a 1-1 draw with Skeid. It was a good day for Östersunds in the Swedish top-flight, as they picked up their first win of the season with a 3-2 victory of Falkenbergs. Charlie Colkett scored his first league goal for the club with a long-range strike and Curtis Edwards provided two assists. Ravel Morrison and Jerell Sellars also played. There was no fairytale start for Bodens in the third-tier of Swedish football though. Having been promoted from the fourth-tier last season, their campaign got off to a 4-0 loss against Linköping City. Former Stevenage man Zak Guerfi and Jack Serrant-Green both featured for Bodens. Elsewhere in the third-tier, Laurie Bell‘s debut for BK Forward ended in defeat but there was happier news for Jay Naiwo whose Sandvikens side won 3-1. In Turkey, Cameron Jerome couldn’t prevent a 1-0 loss for his side Göztepe against Akhisarspor. He has just three league goals this season. In Greece, former Dumbarton winger Amadou Kassaraté had a day to remember for third-tier side Thesprotos. He scored a brace and was named man of the match as his side beat Nafpaktiakos Asteras 3-0. He left the pitch to the fans cheering his name and Thesprotos side are now second in the league and hopeful of earning promotion. In Cambodia, Charlie Machell played the full ninety as his side Svay Rieng kept up their 100% start to the season with a 2-0 win over Kirivong Sok Sen Chey. That’s their third win in a row now. In MLS, there was another red card for an English player as Michael Mancienne was sent off against Colorado Rapids for New England. His side went on to lose 1-0 to a Rapids side featuring Jack Price. In the USL though, there was a trio of assists as Lewis Hilton, Jack Barmby and Liam Trotter all set up goals for their respective sides. Many other Englishmen also featured in the USL but still no debut for England youth international goalkeeper Curtis Anderson since he made the move to Charlotte Independence, he was an unused substitute again. 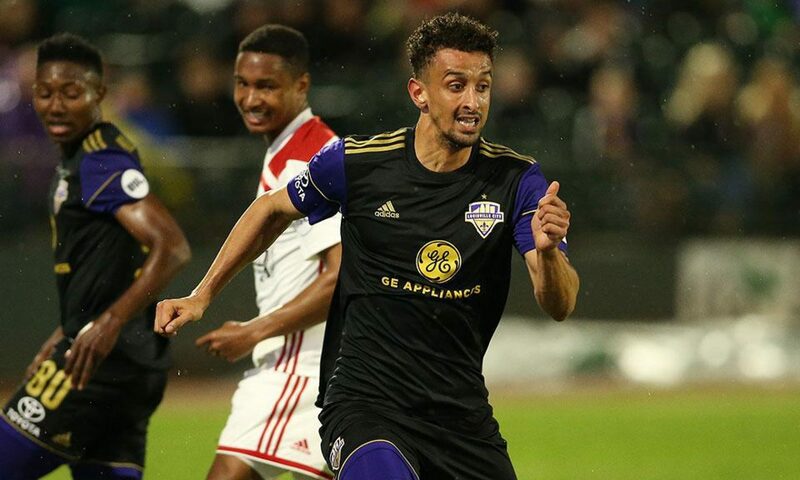 Finally in USL League One, Paul Clowes and Cameron Saul helped Greenville Triumph win their first ever match in their history as they beat Lansing Ignite 2-1. Next PostNext Why are English Footballers in Such High Demand?